It’s been a while since I sat down to floG (my invention- a cross between facebook and blog);. But what better day to write than today! Happy Father’s Day to my dad and to all the fathers and future fathers to be. I love my Dad. Absolutely, Unconditionally. So much so that my Mom jokingly used to tell me: "go g Right from when I was a little girl, I knew he was special. When I had a growth spurt in my childhood my dad coined the nickname: Ehis Eyeast because he said I grew like yeast. I remember how he would make us laugh with stories about his childhood and high school education, his sojourn in America in the times where racism was alive and kicking, his conversion into the Seventh Day Adventist Church. I love my dad because he is my hero. He taught me to be strong, independent and tenacious. Let me share two vivid memories. My childhood friends know: I cannot draw to save my life. In Primary school (I was probably 7 or 8 years), we had an assignment- to draw a map of Nigeria, with key agricultural produce for the different regions. I cursed Nigeria for being so blessed agriculturally! After struggling for about 3 hours, I went to my Dad and said: "I just cannot draw. I cannot draw a goat, I cannot draw yam." My dad, the ever humorous guy, laughed and said: "As long as the goat and the yam look different, its ok!" I was 10 years, and first term in Secondary School. I was exposed to new subjects which I had not done in Primary School. My result was not good. I placed 28th in a class of 41 students. I slunk home; and hid my results. In the evening, my dad was ironing (did I mention Daddy loves ironing, and till this day, he will iron my clothes for church? ); and I sat down on the floor beside him. I started by asking my dad what is the least position I can 'carry" in a class of 41 people. His response was: "Well, you have to be above average, so that means around 13th to 15th?" Then my dad said something that shaped me till this day. – He said: "It's okay; It’s the first term. I know it’s hard now, but soon you will get the hang of it. You are not the bottom of the class- I know you will do better next time!" What a father, what a father. All through the years, I have drawn on those memories and forged ahead in life. When I start a new role or a new assignment, I know it will be daunting and challenging at first. I may not do the best from day 1; but I know it will get better. I may not be a gifted artist and I struggle with analytical projects and numbers; but like my dad says, as long as the goat is different from the yam, it’s OK. When I braved my way through my Industrial Attachment (IT) in Shell Port Harcourt, stuck up in a tiny room with a sewing machine for company, my dad told me: "You stoop to conquer." When we opened a bakery and sold bread which some people considered weird; my dad held his head high and said: "There is dignity in labor." When I stared working, my dad advised me: "Work as if you work unto God." When we had personal tragedies, my dad shook it off and said: "Even though kings die, men must eat." When I wanted to move to Geneva, against the advice of well-meaning friends who were worried I would be single forever, my dad said: "You have to live your life for yourself." And when I got married, on the day of the wedding, I looked into his eyes and I cried. Because I realized at that moment how important he was and is to me. My dad makes me want to go to heaven; because if he is a teeny percent of what God is like; then God must be super-duper awesome. 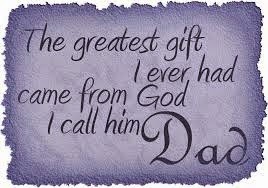 So for those of us who are still fortunate to have our Fathers with us, Give him a call, and tell him you love him. And for those of us who are fathers already; take a cue from my Dad. Support and encourage your children. Don’t get me wrong- the rod is to be used (and was used) when needed. But let the overriding memories be that of love and support. For me, I say Happy Father’s Day Daddy. I love you. Absolutely. Unconditionally. Just like my Fathers’ Eyes. Moved to tears reading this. President Obama needs to read this your "Father's Day" write up. You write so well that I sometimes wonder if you're brought up in the former Bendel State. This could pass for any good standing ovation speech any day. God bless you always.